First you have to cook the polenta. This is done best the day before. That way it is easier to cut and won’t fall apart during frying. Just cook the polenta according to the instructions on the packaging with water and season it with salt, pepper and nutmeg. Then you stir in the vegan Parmesan and spread the polenta evenly in a rectangular cake pan. Let it cool down and put it in the fridge overnight. The next day, turn the cake pan upside down and cut the polenta in small rectangles. Then you go on with preparing the veggies. Therefore you clean and slice the mushrooms. 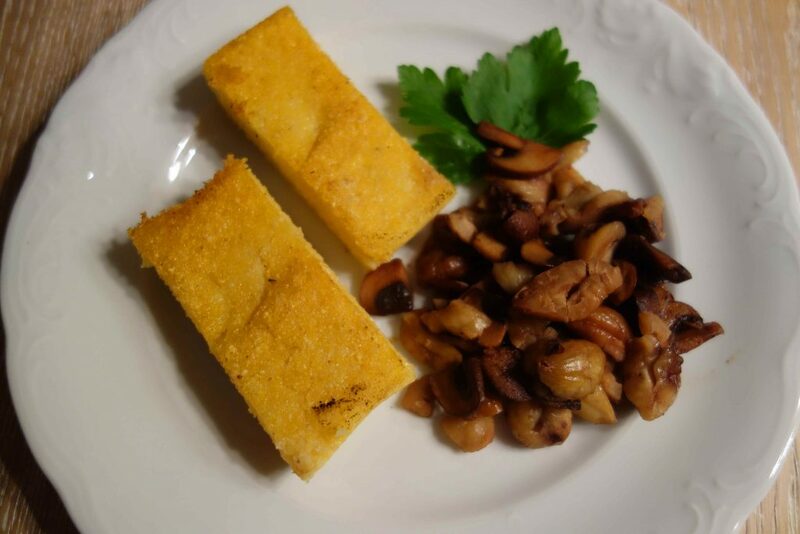 Pour some oil in an iron pan and fry the polenta slices until they are nice and crisp. Be careful when turning them, otherwise they will break! In another pan fry the mushrooms with some oil. Then smash the chestnuts and put them in the pan with the mushrooms. Pour in a splash of port wine and season to taste with salt and pepper. Now you can arrange everything nicely on the plate and garnish with some fresh parsley. If you want some fresh greens, I would recommend a rapunzel salad with mandarine, walnuts and a light vinaigrette.